Aiming for leading in innovation, research, and empowering community professionally, on July 24-26 2017 Jusuf Kalla School of Government Universitas Muhammadiyah Yogyakarta (JKSG) in collaboration with Asia Pacific Society for Public Affairs (APSPA), Universiti Utara Malaysia, Khon Kaen University, Maejo University, Thammasat University, Rizal Technological University, De La Salle University, Korea University, and supported by The American Institute for Indonesia Affairs (AIFIS) and Kompas Media held the 2nd Journal of Government and Politics – International Conference (JGP). Inviting speakers from various reputable University, postgraduates students, and researcher this conference was driven to coin graduates who are noble, confident, and capable of sciences and technology, and valuable for mankind, nation, and humanity. “The Journal of Government and Politics (JGP) serves as a bridge between politics on the one hand and public administration and policy studies scholarship on the other. Moreover, JGP aims to develop political science, organizational, administrative, and policy science that are included in the government governance. Besides that, this journal is committed to unique and rigorous scholarship which is beneficial for the best conceptual and theory-based research work in the field.” Said Dr. Eko Priyo Purnomo while delivering his greeting speech as the chair of 2nd JPG-IC, Monday, June 24, 2017. 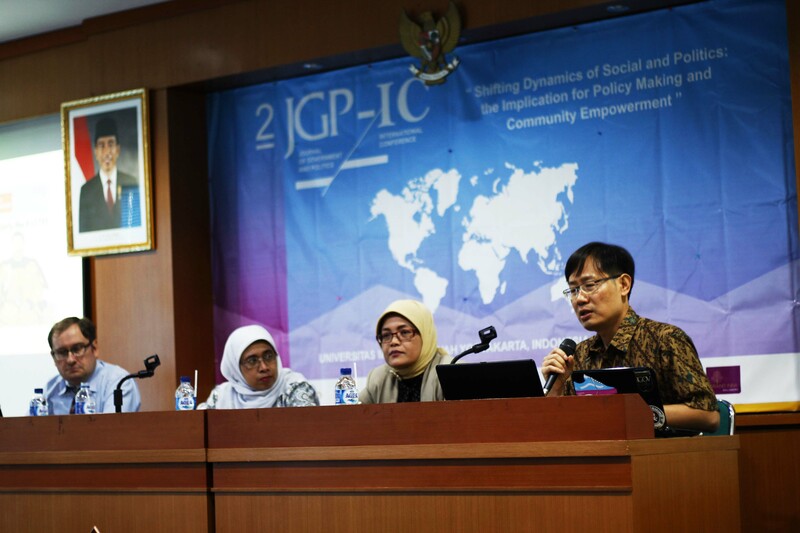 As the opening session of the 2nd JGP-IC 2017, presenting Dr. Chi-fun Hung from National Cheng Kung University, Dr. Non Naprathansuk from Maejo University, Chris Christoper A. Woodrich from Gadjah Mada University, and Dr. Titin Purwaningsih from Universitas Muhammadiyah Yogyakarta as speakers. Pointing on Good Governance and smart city issues in Indonesia, these issues seem necessary taken which suit to “Shifting Dynamics of Social and Politics: the Implication for Policy Making and Community Empowerment,” as the appointed theme for this conference. This session aiming for the participant’s awareness of the importance of the acknowledgment to history which beliefs could drive the next generation into realizing good government for Indonesia.